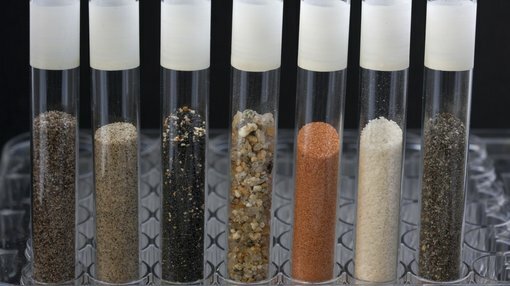 Rumble Resources (ASX:RTR) has partnered with the Commonwealth Scientific and Industrial Research Organisation (CSIRO), to investigate alteration mineral footprints at RTR’s Braeside Project, which is located in the Pilbara region of Western Australia. With the CSIRO having expertise in mineral exploration interpretation, the duo will undertake a research program geared towards the wide pervasive alteration zones associated with base metal alteration on site. The collaboration will see the CSIRO aid in defining alteration signatures associated with base metal mineralisation. Importantly, previously completed drill hole spectral studies by RTR have confirmed widespread mineralisation at Braeside. The company has received a $50,000 grant via the Australian Government’s Innovation Connection program, which is to be matched by RTR’s own funds. These funds will facilitate the commencement of the project. RTR Technical Director Brett Keillor commented on the announcement, “Rumble has over 1000km2 of prospective tenure, much of it exposed and suitable for spectral mineral mapping. CSIRO is the premiere organisation in Australia with respect to the application of spectral research to exploration. Previous exploration by RTR, including detailed surface geochemistry, prospect geological mapping and first pass RC drilling, has highlighted a strong association of base metal mineralisation with wide zones of pervasive silica-sericite-chlorite alteration. The base metal mineralisation extends over a 34km strike within E45/2032 and is completely open. 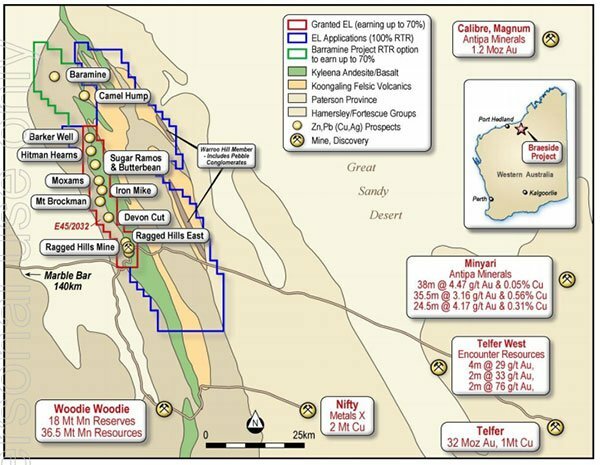 The mineralisation is associated with several altered structures which include the historic High Grade Ragged Hills Mine located at the southern end of the prospective zone. 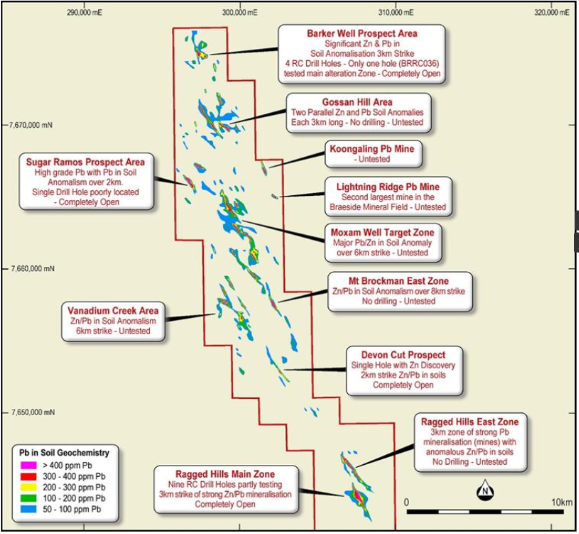 Within the E45/2032 tenement are 11 instances of significant base metal in soil, with only four of these having been partly tested with the latest reconnaissance RC drilling, which identified a new high-grade zinc discovery at Devons Cut in the maiden drill program (below). CSIRO will support RTR in their exploration R&D efforts as part of an Innovation Connections project. RTR expects the study to be completed in five months, which will run parallel with its current exploration program at the Braeside Project.